Light weight pedals with deep concave. The concave platform makes it perfect for gravity riding. -17 mm Low profile center design. -With IGUS high molecular bushing. -Full machined alloy hardware(spacers and axle ring). -2 level thread grip pins. From right to left: Axle/Graphite nylon spacer/O-ring/Alloy Cap/IGUS plastic bushing (2pcs)/Rear end seal kit/Axle nut/Snap ring. 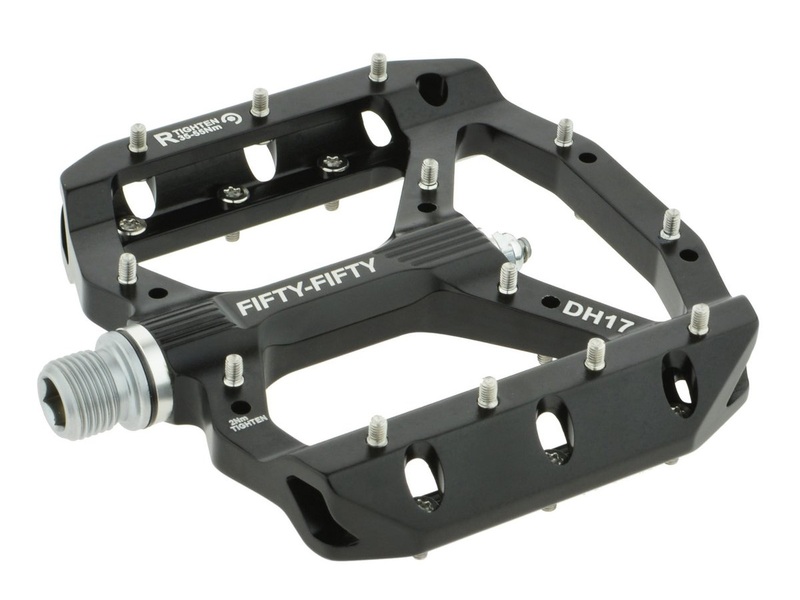 DH17/AM11 Pedals use IGUS plastic bushings to aviod damage to axle. The axle system uses 3 o-rings and a graphite nylon spacer to ensure waterproof and dustproof. Dual bushing structure lowers the pedal center to 14mm. ①IGUS plastic bushing: The whole bushing is made of high molecular weight/density teflon without a steel base. ②Tradition bushing: Teflon coating with steel base. When the teflon coating is wore out, the steel base begins to 'eat' the axle.